The Diplomat’s Zachary Keck speaks with Dr. Pavin Chachavalpongpun, a fugitive of the Thai Junta. The Diplomat’s Zachary Keck recently spoke with Dr. Pavin Chachavalpongpun, associate professor at Kyoto University’s Center for Southeast Asian Studies, about the Thai coup. Chachavalpongpun, a Thai national, is currently a “fugitive” after he failed to answer a summons issued by the Thai junta. 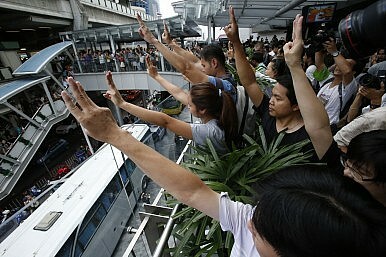 Since the Thai coup of May 22, what has happened in Thailand? What are the goals of the coup? On May 22, the Thai military staged the 19th coup since Thailand abolished its absolute monarchy in 1932. Immediately, the military junta embarked on eliminating thorns in its power position, including politicians associated with the deposed Yingluck Shinawatra government, anti-coup political activists, and academics known to be critical of the coup makers. Their assertion that the coup was necessary to end political deadlock and is a catalyst toward greater democratization in Thailand is simply ludicrous. Free and fair elections are never on the Thai military agenda. The coup is the Thai elite’s plot to dominate the looming royal succession. Thus, the hand of the military is here to stay. There have been reports of critics of the coup being pressured by the military. What can you say on this matter? Certainly, the military has striven to silence its critics. Instead of launching a violent crackdown on protesters, the junta has declared psychological warfare against them. One of their weapons is to issue a series of orders summoning certain individuals for questioning about their apparent wrongdoings. This process, according to the junta, is necessary to “adjust” their attitude about politics; their “reeducation” should not last more than seven days. Those refusing to answer the summons are faced with arrest warrants and two-year imprisonments. My name is also on the list of the most wanted by the Thai junta. Since the coup, I have affirmed my standpoint: rejecting the legitimacy of the coup. Decidedly I did not answer the summons, and as a result, an arrest warrant was issued; I officially became a fugitive. Unable to return home to visit my family, constant fear remains that the junta could intimidate my relatives in Bangkok should I continue to criticize the military through my academic work. Have you spoken with or are you aware of the fate of any other critics? I have kept in contact with my academic colleagues and some political activists in Thailand. Most of those summoned were released after three to seven days of detention. Their role and political positions determine how they were treated in the army camp. In low-profile cases, they would be interrogated by military officers, instructed not to further engage in political activities and forced to sign agreements confirming that they were well treated under detention. Once freed, most of them have stopped speaking out publicly to avoid being arrested again. Has the junta used any other tactics to eliminate anti-coup elements? The hunting game was not restricted to those names on the list. The army sent its troops to the far-flung north and northeast regions, the strongholds of former Prime Minister Thaksin Shinawatra and the power bases of the red-shirt movement, to annihilate networks deemed hostile to the elite. Red-shirt activists, anti-coup academics and NGOs have been harassed, intimidated and detained arbitrarily. Some had their houses searched, and belongings confiscated. Red-shirt villages were forced to shut down; red flags on their houses were burnt. Some leading village heads disappeared, while others were placed under detention without any information on their whereabouts and when they might be released. I’m curious about your case. When you refused to answer the summons, did the pressure stop or have they tried other tactics to silence you? Outside Thailand, anti-coup personalities and critical academics, including myself, while having the luxury of being out of reach of the junta, are unable to ignore intimidation and harassment. In my case, pressures come in different forms and methods. The junta instructed the Consul General in Osaka, close to Kyoto where I am based, to “discuss” with my director, hoping to bring discomfort to the Center for employing me. The Consul General accused me of being biased, ignorant about the coup, and thus calling into question my academic competency. A day before I gave a lecture at a gathering in Brussels via Skype on the human rights crisis in Thailand, a female representative of the Royal Thai Embassy in Belgium appeared to attempt to lobby the organizers to cancel the event. She once again accused me of working in favor of the previous elected government that was overthrown by the junta, and claimed that I often gave interviews to media networks close to Thaksin. In tandem, she legitimized the coup as a necessary step to move Thailand forward. Back in Bangkok, the National Council for Peace and Order (NCPO), the governing body of the junta, has worked closely with the Thai Foreign Ministry in hunting down their critics overseas. In my case, there was a suggestion from the junta to pressure the Japanese government to deport me. Reportedly, one high-ranking military officer absurdly suggested an abduction option. The Foreign Ministry responded by holding talks with the Japanese Ambassador to Bangkok, possibly to discredit my professionalism and to seek help in monitoring my movement. We’ve read a bunch about Chatwadee “Rose” Amornpat in England. What can you tell us about her case? In more severe cases, such as that of Chatwadee “Rose” Amornpat, a self-appointed Thai-born anti-monarchist based in England, more extreme measures were implemented. The Foreign Ministry demanded cooperation from its British counterpart to extradite Rose back home to serve a lengthy jail term for insulting the much-revered King Bhumibol Adulyadej. But the British Ambassador to Bangkok, Mark Kent, confirmed that Rose is a British national and would not be deported despite the existence of the extradition treaty between the two countries because there is no lèse-majesté law in the UK. When legal means proved futile, hyper-royalists in London took matters into their own hands by invading and vandalizing Rose’s property. This kind of “public pressure” is scarily menacing. Where do you see Thailand going from here? As I said in the beginning, the military has planned to stay for a long while, in order to be able to manage the royal succession. Some even said that the Thai junta may imitate many past policies from the Myanmar junta, such as to reserve a section in the parliament for the military, which will be important if the junta wants to take a full control of politics. The future is grim. This will further obstruct the pace of democratization and worsen the human rights situation in my country. Standing with the world’s more developed nations has long been an obsession for Thai elites – and a source of anxiety.